My cyber friend, Arlee, in Canada played with my pattern and her stash of unusual mixed media art materials to create "Miss Delishia Pomentea". The two foreground birds were created just before I left the cottage. The orange one was done last spring when I first began. All of them got their perches this week after I got back to Tennessee. These two with headdresses were made at the cottage as well. I used tiny lengths of fuzzy yarn from the two skeins in the picture to adorn them. The ruff around the brown one's neck makes him look a bit like a vulture. Can vultures be cute? Here's how I get the yarn on the birds. I cut short lengths of yarn from the skein. In this case, I include a touch of blue green at one end. Teeny dots of glue were applied to where I wanted the yarn on the birds body. I use a squeeze bottle that comes with an applicator. There are syringes that can be purchased at craft stores. Carefully lay the yarn over the dots of glue. Use fine straight pins to hold it place until it dries. When removing the pins give them a twist to release them from the dried glue so the yarn is not dislodged. I've used as many as three lengths of yarn for a headdress ... each one applied separately ... and as few as the one for the vulture's ruff. To make the birds stand more easily and securely, I glue their feet to objects ... some to driftwood collected on the beach in Michigan and some to shells that I've found on past vacations. Apply a strong, thick, industrial type glue such as "E 6000" to the bird's feet. I secure the feet with rubber bands or clips (whatever works for specific areas) to the object until they're dry. It is easier to work on one foot at a time ... sometimes waiting until the one is set before gluing the other. It may be necessary to shape the toes (claws?) with pliers before the gluing process. If the perch object is rough on the bottom, a piece of felt or felted wool gets glued there to protect the surface where that bird may end up living. 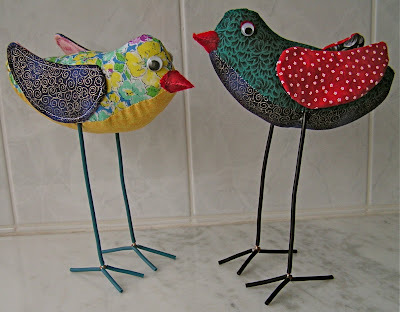 I hope many of you are enjoying watching these birds come to life here on my blog as well as in your own studios and sewing rooms. It isn't even noon and there have been nearly 200 visitors from the Netherlands to read about my birds. A member of an internet group posted this photo of her soooo cute birds on its site. I'm curious as to how the legs are constructed and what material(s) were used. The googly eyes are cute ... and I see the beaks were sewn on and shut rather than glued. Many people have downloaded my pattern which is a PDF file from HERE (note: while you're there, click on "more from this publisher" in the column on the right to access the downloadable instructions for constructing it). 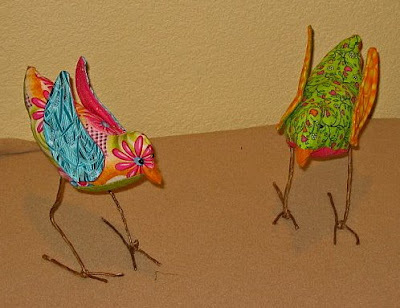 Two of them are college students in Colorado (one of which is the niece of cousin Judy) who made these two pretty birds. I'd very much like to see any birds made from this pattern. Please send me a photo or a link to where you've posted one. It will get added to the Picassa album of "Birds"
Making these birds is like eating peanuts ... I cannot stop. I keep finding new combinations of fabrics that will make wonderful birds. The one on the right has body and wings made from a small remnant of Japanese floral cotton. The center one that I think looks like cloisonne is a combination of decorator polished cotton fabric samples. While the left one has all its parts cut from different areas of the same batik fabric. 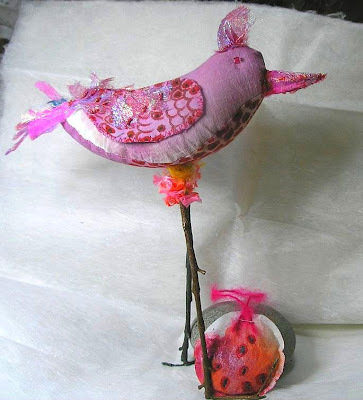 "Sewing Bird" (below) has a body cut from pieced scraps given to me by my friend, Helen. The wings are made from fabric with sewing machines on it that I had begged from Elaine to make our guild's special award ribbon for "Best Machine Work". As a thank you to her for sending it (and more than I had asked for) this bird flew to her house earlier in the week. I over painted the button fabric used for the breast area with an orange so it would blend with all the others ... the white background was too much contrast with those bright pastels. Here are two very blue days with big cumulus clouds floating across the sky. They are much like most of days we experienced through September. This one is a calm day with strong reflections glaring off the water and sand. While this one is more typical of large waves washing ashore. Here's #68 laid out and pinned before the machine quilting finished it off. The skies for both of these are the "other side" of pieces cut from a blue silk blouse with roses scattered throughout. It was given to me by a friend ... she purchased #67. That same silk was used for the prairie flower pieces I made about a year ago. They can be seen here and here. The point of the auction is mostly to allow blog fans to have first dibs. The point is also to allow people a chance to buy affordable contemporary functional art. I have made these clocks identical (as close as possible given the medium) which also keeps the price down as the level of creativity stays even instead of making a completely new piece each and every time. Go to Paula's blog to get details for Ebay so you can join the excitement of possibly getting a wonderful piece of art. For this Smoky Mountain series I decided to keep the composition small (9"x 9"). To give the pieces substance as well as to emphasize the distance of the furthermost mountains they are framed with 2" wide borders. These borders are created by laying and couching yarns as well as adding decorative machine stitches to a foundation of fabric. All four borders are constructed in one piece. The surface foundation fabric is layered with batting and a backing fabric. I use a spray adhesive to adhere those three layers so they don't shift while doing all the machine work that lies ahead. Also apply a spritz of spray adhesive to the top surface of the foundation fabric. Make a selection of decorative yarns that complement the composition. I chose two variegated chenille yarns plus one that is twisted with a finer thread and a decorative rayon one. Cut lengths and arrange them on top of the foundation. Select a tulle netting that complements your choices and the composition for which the border is being created. I used black. Spritz a layer of adhesive to the underside of the tulle before carefully laying it in place. Pin baste all the layers together. Machine stitch around the outside edges to secure the yarn ends. Run straight rows of stitching parallel to and between the rows of yarns. I had used a metalic copper thread for that first set of stitches. And then I couched rows of this twisted fiber yarn across the piece. To read the tutorial about the method I use for couching yarn go here. Scroll to the middle of that post for the instructions to couch yarn on a surface. The first part is about couching yarn to raw edges. This is the result of couching that variegated twisted linen type yarn. My last step was to fill in any spaces with rows of a narrow zig-zag pattern using a #40 quilting thread. When you are satisfied with the amount of stitching trim one ragged edge from the layered border fabric. Measuring from this clean edge cut the fabric into four borders. For this small composition each of the borders are the same width. On some of my larger quilts the bottom border has been cut wider than the other three. Do not cut any length away from the borders. Align the edge of a border with the edge of the quilt. Apply scotch tape to keep the pieces together. Turn it right side up and stitch the two together with a wide zig-zag stitch. Apply the border on the opposite side of the quilt. Then zig-zag stitch the other two borders just to the sides of the quilt. All the corners will be overlapped and hanging loose. My preference is to miter the corners of these borders. Although, they certainly could be finished otherwise. Use an acrylic ruler to draw the angle between the corner of the quilt and where the edge of two borders meet. For equal width borders this will be 45 degree line. It will be a different angle for two borders that are different widths. Cut along this line through both layers. It's easier to cut one layer and then draw on and cut the other. Tape and zig-zag stitch the miter closed. To finish the raw seam between the borders and the quilt I cover it with a flat decorative yarn. It is zig-zag stitched in place by machine. Do this before applying decorative yarns to those same seams on the front of the quilt. Here's a close-up photo of the decorative yarns that finish the front side of the quilt. Use the first method described in my tutorial for couching yarns to apply it to the outside edge. Sometimes I cover the mitered corner seams with yarn. Doing so will draw attention to that detail. Omit that step if doesn't work for your quilt. ALL this wonderful inspiration arrived in my mail box the other day. These goodies came from Deb who was clearing excess "stuff" out of her studio. I couldn't wait to get out of bed this morning to play with that pile "stuff". I separated out wonderfully dyed bits of fabric for fall trees in the maybe Smoky Mountain series, some pieces went into the Lake series bag, and I pulled "stuff" for this idea. A few choice pieces are laid out on a background of heavy upholstery brocade (a gift from another friend) that is pieced together alternating sides (front/back). For quite some time I've been tempted to create a "slow piece" ala Jude of Spirit Cloth. This just may be that project. It would be a fun challenge to incorporate that bright blue cotton crocheted medallion. I cut Deb's ball of rainbow rayon ribbon yarn into various lengths and tied it into this mutual project with which my young friend Katrina and I are playing. This piece has been hanging in my studio for over a month without having an idea of what my next contribution should be. Come to think of it, there are some of Deb's bits and pieces incorporated in my first round of this project. Go here to read about the last round robin project Katrina and I created.